One of the biggest challenges for every LDS Seminary student is Scripture Mastery! I know this from personal experience. As a former Seminary teacher, I spent hours helping less than enthusiastic students pass off those 25 assigned scripture references each year. Four years of seminary attendance yields 100 scripture references committed to memory. That's a really tall order! I did my best to memorize these verses during the few years that I taught. But I can assure you, it's not an easy task; especially at six in the morning! And please, don't even think about testing me now! For this very reason I can't wait to tell students, teachers and parents alike, about the newest version of the LDS Scripture Mastery App by The Church of Jesus Christ of Latter-day Saints! I downloaded the app onto my iPhone early this morning, and after "playing" with it for awhile -- all I can say is WOW! Lets face it, having these specific verses of scripture and references committed to memory is a great accomplishment. It truly is a thing of great worth. There's no question that it will produce more effective missionaries, parents and teachers throughout the Church. I'm completely sold! However, up until now not only has memorizing the scriptures been a difficult task, but even more so -- retention. 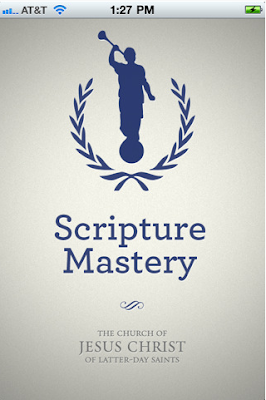 Seminary teachers do their best to make Scripture Mastery a fun part of attending Seminary. You could ask almost any Seminary teacher about SM and they will be able to share with you a bucket load of ways they have tried to help their students be successful at memorization -- and many are! But it's work, and a lot of it. Using a platform that our kids are familiar with and really enjoy, is a brilliant use of technology! 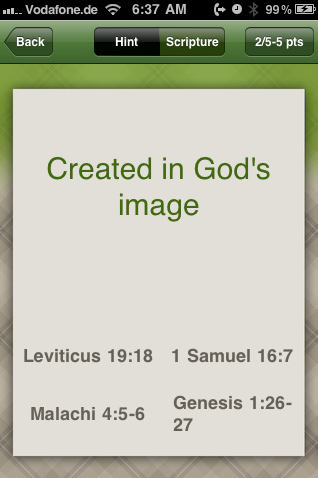 As I mentioned before, playing with this new Scripture Mastery app is FUN! Everyone is going to love it. 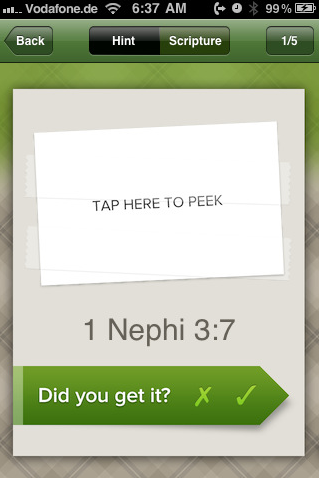 I think that even my 8-year-old grandson is going to enjoy the many different features for memorizing the scriptures available in the app. Won't his Seminary teachers be impressed when they get him in a few years! One of the more common ways seminary teachers use to help students memorize a scripture is by putting up the entire verse of scripture and each day taking away more words until the students have it mastered. 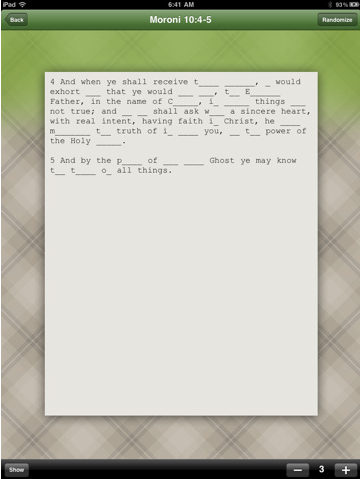 Personally, I think this is one of the most effective ways to memorize -- and LDS Scripture Mastery has built this feature into the app. 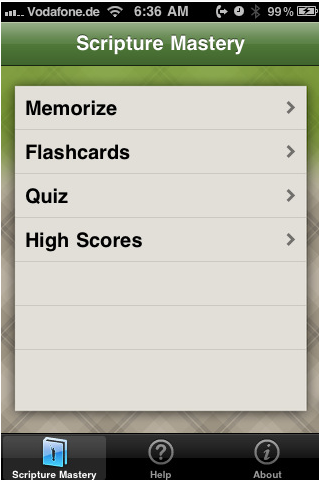 "Version 2.0 adds a new Flashcards game as well as a quiz game to help master the scriptures. Track your high scores on the various games to see how you improve." Once you've memorized a scripture, remembering where to find it can be a bit tricky. That's why I really like this new feature where you are given a few words from a specific scripture and have to then match it to the exact reference. I had a lot of FUN playing this today. I was surprised how well I did! Scripture Mastery is literally having the ability to command not only the what but the where of a specific verse or verses of scripture. Being given the specific verse(s) and then getting to the point that you can recite the entire verse or verses is a feature that is also included in the newest version of the LDS Scripture Mastery app, via e-flash cards. This app is currently available on the iPhone, iPod Touch and iPad. You can download LDS Scripture Mastery Here! 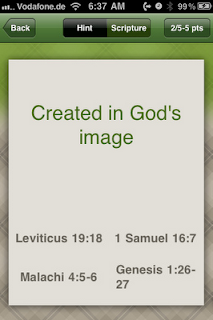 NOTE: The app also include The Articles of Faith.